QUOTATION: Written quotations are submitted for acceptance within thirty (30) days of issuance or within such shorter period as may be specified in the quotation. PRICES: Prices quoted are in U.S. dollars and are effective as of the date of the quotation. Prices are valid for 30 days unless otherwise agreed, in writing. Clerical and stenographic errors are subject to correction. 10% payable net 30 days. Orders will be invoiced upon shipment and Terms of Payment will be as specified on the face of the invoice. Source Engineering’s obligations to deliver products hereunder shall be subject to approval of all orders by Source Engineering and its Credit Department. Source Engineering may require full or partial payment in advance. If shipments are delayed by the buyer for any cause, payment shall become due from the date on which Source Engineering is prepared to make shipment and storage shall be at buyer’s risk and expense. If manufacture is delayed by the buyer for any cause, a partial payment based upon the percentage of completion of the order shall become due from the date on which Source Engineering is notified of the delay. Source Engineering may at any time, when in its opinion the buyer’s financial condition warrants, alter or suspend credit and delivery until such time as arrangements for payment are made which are satisfactory to Source Engineering. TAXES: Source Engineering prices do not include sales; value added; inventory; use; or other taxes, which are the sole responsibility of the Buyer. If Buyer is exempt from the payment of any tax it is the duty of the Buyer to furnish Source Engineering the proper exemption certificate. DELIVERY: Deliveries are scheduled only after receipt of order, clarification of required technical information, resolution of commercial issues, and customer approval of drawings when required. Shipping dates are estimated based on conditions prevailing at the time of quotation, but are not guaranteed without Buyer’s prior written consent, no delivery shall be made more than seven (7) calendar days prior to the applicable specified date. In the event that a carrier specified in the order by Buyer is not used by Source Engineering, all excess costs as a result thereof will be at the expense of Buyer. Risk of loss shall pass at point of shipment. Source Engineering shall not be liable for delays in delivery or failure to manufacture due to force majeure or causes beyond its reasonable control such as Acts of God, acts of omission of the buyer, acts or omission of civil or military authority, priorities, fire, strikes, floods, epidemics, quarantines, restrictions, riot, war, delays in transportation, transportation vehicle/vessel shortages and inability to perform due to inability to obtain necessary labor, materials or manufacturing facilities. In the event of any delay such as above described, the date of delivery shall be extended for a period equal to the time lost by reason of such delay. F.O.B: (Freight on Board) Lynden, Washington, U.S.A.
SECURITY INTEREST; To secure payment of sums due, the Buyer grants to Source Engineering a security interest in the goods purchased and in the proceeds thereof. At Source Engineering’s request, the Buyer shall sign financing statements and other documents necessary to perfect and continue the security interest. If Source Engineering in its sole judgment questions Buyer’s ability to pay for the goods, Source Engineering may require payment in full in advance of delivery or manufacture of the goods. Failure to adhere to Source Engineering’s terms may result in a shipping hold on future orders and/or a reduction in the credit the company will extend. All payments are to be made to Source Engineering LLC, PO Box 528, Lynden, WA 98264. WARRANTY: Source Engineering warrants to buyer, and buyer only, new equipment manufactured by Source Engineering and covered hereby, against defects in material and workmanship while in normal use and service for a period of 12 months from date of shipment. This Full 1 Year Warranty applies only to equipment that has been properly installed and maintained and subjected to normal use. It does not cover damages caused by abuse, misuse, unauthorized repair, accident, alteration, modification, electrical brownouts, power surges, loose wires, loose screws, nuts or bolts. Also excluded are ordinary service and maintenance items such as replacement belts, lights bulbs, tires, wear liners, limit switch adjustments, hydraulic seals, and the like, required as the result of normal wear and tear. Certain components provided to Source Engineering for use in the purchased equipment are guaranteed only by the manufacturer of this component. Such guarantees vary from manufacturer to manufacturer. While in such cases Source Engineering does not provide independent warranty coverage for this part. This Full 1 Year Warranty supersedes any representations concerning the equipment sold to the Buyer which may have been made by Source Engineering’s agents or employees, or contained in advertisements. If any model or sample was shown to the Buyer, that model or sample was used merely to illustrate the general type and quality of the equipment and not to represent that the equipment would necessarily conform to such model or sample. 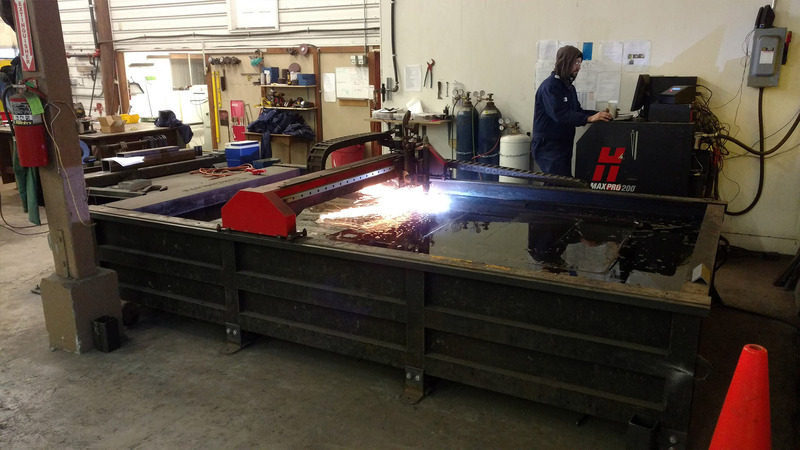 The Buyer’s sole remedy for any defect of material or workmanship in the equipment sold by Source Engineering is as provided by this Full 1 Year Warranty. IN NO EVENT SHALL Source Engineering BE LIABLE FOR ANY CLAIM FOR SPECIAL, INCIDENTAL, INDIRECT, FORESEEABLE OR CONSEQUENTIAL DAMAGES RESULTING FROM THE USE, LOSS OF USE, BREAK DOWN OR MALFUNCTION OF THE EQUIPMENT, INCLUDING LOST EARNINGS OR PROFITS. Source Engineering shall not be obligated to provide any warranty coverage whatsoever for any defect not communicated to Source Engineering in writing within the period designated in this Full 1 Year Warranty. Delivery of goods by Source Engineering to a common carrier for shipment to the Buyer shall constitute delivery of the equipment to the Buyer. Regardless of freight payment, title and all risk of loss or damage in transit shall pass to the Buyer, and all claims for loss of damage during shipment must be made by the Buyer directly to the carrier. Buyer shall notify Source Engineering in writing within thirty (30) days of discovery, within the warranty period, of any alleged defect and permit Source Engineering or its representatives to make such investigation, examination and tests as it deems appropriate. If requested by Source Engineering, the buyer will return the alleged defective product to Source Engineering’s factory, freight prepaid for examination and testing. If Source Engineering determines the product is defective, Source Engineering will either repair or replace such product with a like item of Source Engineering’s manufacture, f.o.b. Source Engineering’s factory. The responsibility of Source Engineering is limited to repairing or replacing defective material manufactured by it, provided Source Engineering’s examination discloses to its satisfaction that such material has not been altered or repaired, other than by Source Engineering’s approved procedures, subject to misuse, improper maintenance, property of any person, or for loss of revenue or profit, or for any other special, incidental or consequential damages. Any parts or equipment which Source Engineering supplies and does not manufacture shall be subject only to the warranties of Source Engineering’s vendors to the extent Source Engineering can enforce such warranties. Any repairs to, alterations of, or work done on alleged defective products without Source Engineering’s specific written authorization shall void Source Engineering’s warranty applicable thereto. Any action for breach of warranty or other action under this agreement must be commenced within on (1) year after such cause of action arises. THIS FULL YEAR WARRANTY IS IN LIEU OF ALL OTHER WARRANTIES, EXPRESSED OR IMPLIED, INCLUDING ANY IMPLIED WARRANTY OF MERCHANTABILITY OR FITNESS FOR A PARTICULAR PURPOSE. TITLE: The title to and right of possession of the products (or any part or portion thereof) furnished by Source Engineering shall remain Source Engineering’s personal property until paid for in full, and the buyer shall do all things necessary to perfect and maintain such right and title in Source Engineering. PACKING: Prices include Source Engineering’s standard packing for domestic shipments. RETURN OF GOODS: In the event that the Buyer believes a component manufactured by Source Engineering is defective in materials or workmanship during the term of this Full 1 Year Warranty, the Buyer shall promptly notify Source Engineering of the problem in writing. Upon receipt of such written notice, Source Engineering will issue the Buyer a Returned Goods Authorization (RGA) number that must accompany the parts returned to Source Engineering for warranty consideration. This RGA number is valid for thirty (30) days. The Company’s warranty parts invoices (mailed separately) automatically become due and payable upon a customer’s failure to return the defective parts within thirty (30) days. Upon receipt of the defective parts, Source Engineering will make an evaluation, or if necessary, forward the defective parts to the original manufacturer for warranty consideration. The Buyer shall then be notified of the determination made. If the part is found to be defective in material or workmanship, the obligations of Source Engineering are strictly and exclusively limited to the repair or replacement, at the option of Source Engineering, of the defective part. Source Engineering agrees to pay all shipping charges, at UPS ground rates, for delivery to the Buyer of repaired or replacement parts provided the submitted parts have provided to be defective and covered by this warranty. Where expedited delivery of repaired or replacement parts is requested by the Buyer, such additional shipping charges shall be paid by the Buyer. CANCELLATION: No order may be canceled by the buyer except upon written notice to Source Engineering of all costs incurred by it arising out of, or in connection with the order, determined on a basis consistently observed by Source Engineering and in accordance with sound accounting principles. Source Engineering shall have the right to cancel any order or to refuse to deliver or to delay shipment in the event buyer fails to submit payments when due or perform any other obligations of buyer. CHANGES: No waiver or modification of any of the foregoing Terms and Conditions of Sale shall be valid unless made in writing and signed by both parties. In the event any Terms and Conditions of any order submitted by buyer to Source Engineering shall be in conflict with any Terms and Conditions herein, the Terms and Conditions set forth herein shall govern and prevail. INSPECTION: Final inspection and acceptance of products must be made at Source Engineering’s point of manufacture and shall be conclusive except as regards latent defects. The buyer’s representative may inspect the products at Source Engineering’s plant during business hours in such a manner as will not interfere with normal operation. DESIGN/ PRODUCT IMPROVEMENT: Source Engineering reserves the right to discontinue the manufacture, change or modify the design specifications and construction of any of its products without incurring any obligation to buyer. IMPORT PERMIT OR LICENSE: In the event Dollar Exchange Control is in effect in any destination country and/or an Import Permit or license is required by it’s authorities for materials covered hereby, an order will be accepted only upon receipt from buyer of written insurance that Dollar Exchange Controls have been complied with and/or that an appropriate Import Permit or License has been granted disclosing the period of validity, number, date of issuance, and whether the expiration date refers to clearance from U.S. port or arrival at port of destination. EXPORT LICENSE: Export of goods covered hereby is subject to U.S. Government control. If a validated Export License is required, upon receipt of an order Source Engineering will submit an application to the appropriate authorities and acceptance of such order, production scheduling and delivery will be deferred until receipt of the appropriate License. APPLICABLE LAW: This order shall be interpreted and enforced in accordance with the laws of the state of Washington, including the laws of the United States applicable therein. OSHA: All work and materials supplied hereunder will comply with the applicable requirements of the Occupational Safety and Health Act of 1970. CONFIDENTIALITY: All data, designs, drawings, processes, specializations, reports and other technical or proprietary information submitted by Source Engineering to the Buyer and the features of all parts, equipment, tools, patterns and other items furnished or disclosed to the Buyers by Source Engineering in connection with the order (the “Confidential Data”) are to be considered confidential, the sole property of Source Engineering, shall not be used except in connection with Buyer’s provision of the goods to Source Engineering in accordance with the order and shall not be published or disclosed to any third party without Source Engineering’s prior written authorization, unless the Confidential Data or any relevant part thereof is or becomes generally available to Buyer on a non-confidential basis from a source (other than Source Engineering) which is entitled to disclose the same. Upon completion, termination or cancellation of this order, or upon Source Engineering’s request, Buyer shall not, without receipt of Source Engineering’s prior written authorization, advertise or publish any matter relating to this order. LIMITATION: Source Engineering shall in no event be liable for any consequential, indirect, special or punitive damages arising out of this purchase order or any breach thereof, including, but not limited to lost profits or revenue, work stoppage or inefficiencies, impairment of the goods, loss by reason of shutdown or non-operation or increased expenses of operation, whether or not such loss or damage is based on contract, negligence, strict liability or otherwise.